Have you never been to a real Casino? Have you always loved the idea but maybe a little scared because of the myths you hear about the places? Well, a Fun Casino from Shuffles Events may just be the thing you need! There's no risk of losing any money and in fact, there's actually a whole lot of fun to be gained on the night! The Shuffles Events Fun Casino is ideal entertainment for you and your guests. We provide you with Roulette & Blackjack as standard and you can also opt for Poker too! 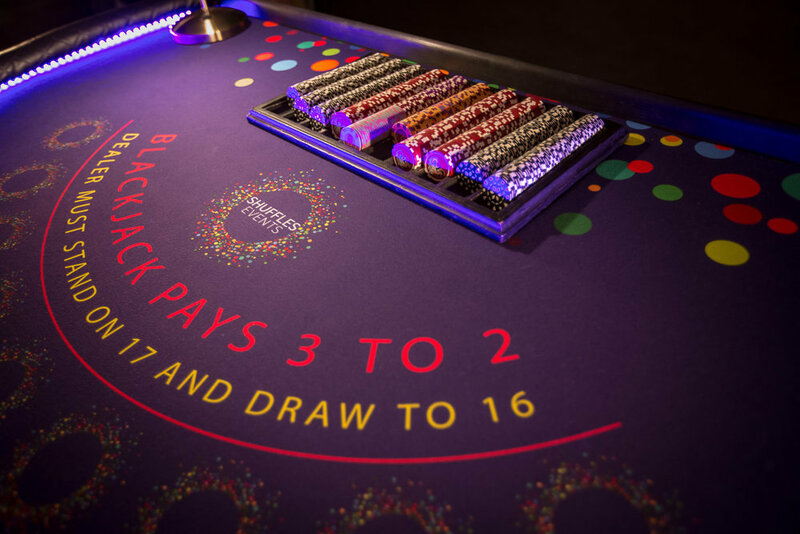 If you've never even played then no worries at all as each of our three croupiers on hand on the night will explain the rules of the game to you and even better, you may just be blessed with beginner's luck and win big! The winner at the end of the night is presented with a bottle of Champagne for doing so well! Our croupiers are truly fantastic and have all been professionally trained, having worked in live casinos, cruise ships and even the odd mafia gambling den (I'll let you work out which one of them that is!) It's really important that the Casino provides you with experienced dealers on ALL tables as this always adds to the fun on the night - you really don't want friends of friends, inexperienced & daunted by it all! Timings - work our the timings of your event and when the Casino will work best. if in doubt, do ask a member of our booking team who can help with suggestions. Tables - more tables is not always better - find the right fit for the right number of guests. Equipment - all the Casino tables are brand new and were built in 2017. LED coloured lighting adds to the night time glow and ensures guests get the feel for the real Casino experience. Our Roulette wheel weighs in at just over 65kg and is a real Casino wheel not a play one so you can be sure we are providing an authentic and unforgettable experience! Location - Our Roulette tables are 9ftx4ft and Blackjack tables are 6ftx4ft wide. Make sure your location will have plenty of room so that guests can come and go as they please. Set up - we usually turn up 45 minutes before the start to set up the tables and then distribute £50 vouchers to all the guests. They, in turn, can then exchange these for chips at the tables when play commences. Once the play is finished and the winner announced, we will pack away the tables and leave the site. Insurance - we are fully insured for Public Liability Insurance and have attended 95% of venues on the Isle of Wight. We know which rooms in which venues work and which don't - again, ask us for information on your chosen venue. Charity nights - If you are planning to hold a Charity Casino night, there are many ways of helping raise funds towards your grand total. Do ask the team for any ideas they have to help raise additional monies.